to celebrate paying the deposit for my new house and signing my first ever lease – at the age of 31 – i took shonali and prakash out for dinner at the local. shonali began my hunt for a home in november, almost as soon as i told her i had accepted a job and was moving back to bangalore. she spent evenings and weekends contacting brokers and traversing the city to seek out a suitable home for me. once i arrived in january, we took off together, looking at places and refining my list of wants and non-negotiables, until i went to hyderabad for work and the quest was once again put on hold. when i returned in march, we went into overdrive, determined to find me a place by the end of the month. she spent most of her saturday afternoons and evenings carting me around town and helping me make my pro-con lists to ultimately make my decision. and prakash got invited along because he helped me out with a few logistical challenges and also served as our driver for the evening. meat lover’s pizza at the local. bangalore, india. march 2015.
because shonali and i are incapable of making decisions [it’s a miracle i chose a house with her as my guide], we let prakash pick our dinner spot. when he mentioned the availability of mince pork with pav at the local, i was sold. located in koramangala above where kwiky’s used to be, the local is a rooftop restaurant and bar with a nice ambience and an appealing menu. i was pretty excited about the mince with pav, but i was also pretty distracted by the rest of the offerings. we put prakash in charge of ordering as well, and i have to say we were all pretty pleased with his choices. for my money the mince with pav was my favourite, but the chicken tikka was pretty good as well. 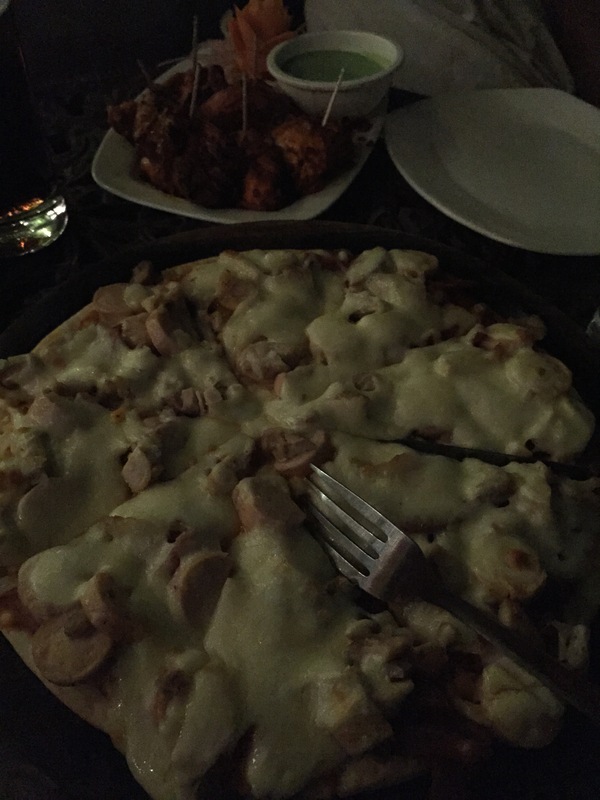 shonu loved the meat lover’s pizza. while the food was good and the place was nice, i do have two complaints. one was that our service was not great. we were at a table in the corner, so we largely got overlooked by our server, who was also visibly nervous and appeared to not really know what he was doing [perhaps he had just started working there. i’m hoping that was the issue]. second, and i know this is nit-picky, but our server confirmed to me twice that he would bring me coke as my mixer and then ended up bringing pepsi. i know this is such a ‘first world problem’, but please forgive me when i say that pepsi is gross. i am a thums up girl all the way but will settle for coca-cola since only the really divey places have the former. but pepsi is a no-no. i will cancel a drink order if they only have pepsi as the mixer, so i was very disappointed when that happened. yummy mince pav at the local. bangalore, india. march 2015.
location: no 467, terrace level, above jimi’s. 80 feet road, 6th block, koramangala. serves drinks: yes. full bar available. wifi available? no idea. but my guess would be maybe. what we ordered: 60ml old monk; 60ml beefeater; coke [but then he served me pepsi :(]; tonic water [drinks]. 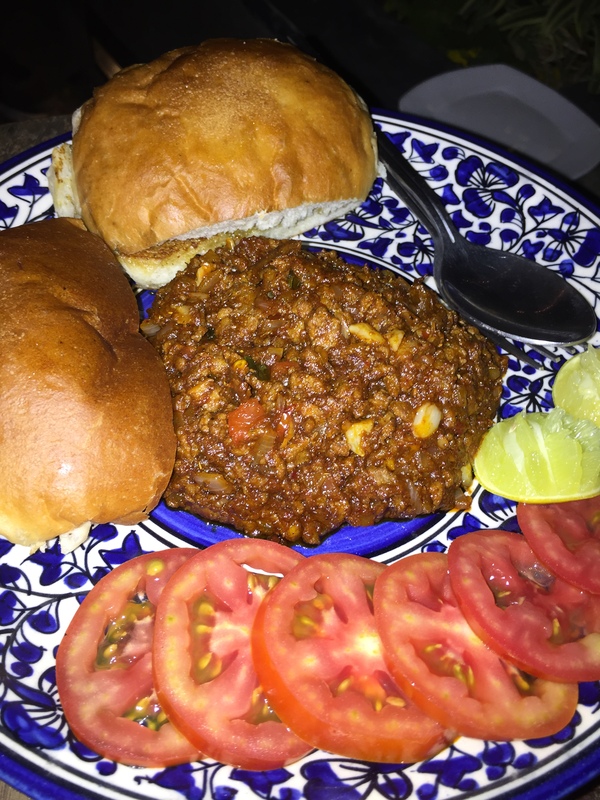 chicken tikka; mince pork with pav [starters]. meat lovers pizza [main course]. our bill: rs 2,260 for 3 people. pretty good value for money, in my opinion. my zomato rating: 3.5 out of 5 // average rating is 3.7.
to keep in mind: sitting in the back corner gives you a nice breeze and a view overlooking the street, but you’ll sacrifice service for the seat. the high tables are nice but are sized for 1-2 people. will i go back? maybe. the service wasn’t great, but the food was good. i’ll try it again in a few months after i have explored a few more places.